This Toasted Caprese Garlic Bread is made with hints of garlic and topped with ripe tomatoes, fresh basil, and creamy mozzarella cheese! Place bread on a large baking pan. Drizzle each half with 4 tablespoons olive oil, followed by 2 tablespoons garlic powder. Top each half with Mozzarella cheese. Bake for about 10-12 minutes or until cheese is just melted. Remove from oven and top each half with tomato slices, salt, pepper, and basil. 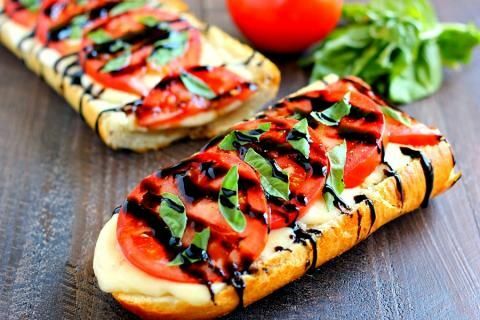 Drizzle balsamic glaze over tops of bread. Cut into slices and serve immediately.